The Diamond Center – Your jewelry superstore! Featuring exclusive designs from around the world…presented to you by Madison and Janesville’s most qualified and caring sales professionals. Blue Moon Event Rentals – Vintage rental items for both large and small weddings, bridal showers, backyard parties, or any event that you want to go the extra mile for! Sugar Pear Design – Specializing in the design of custom, handcrafted invitations, announcements and social stationery, Sugar Pear Design offers the perfect complement to your celebration. Wedding Planner and Guide – Tying the knot soon? Let JBB provide the DJ entertainment; for everything else, try here first. The Knot – Everything you need for weddings: wedding dresses to wedding cakes. Engagement rings, wedding favors, wedding gifts…plan it all online! Balloons by Design – Big or small, professional balloon decor can make any event look great. Catered Cocktails – Mobile bartending service…enjoy being a guest at your own party! Mad-City Chefs – Just the right amount of creativity, personally directed and service-oriented catering to serve up amazing food for your intimate gathering, corporate setting, and every event between. Rodan + Fields – Is your skin ready to say “I Do”? Let us help you glow! Interested in Wisconsin’s favorite wedding crasher, Bucky Badger, making an appearance at your reception? 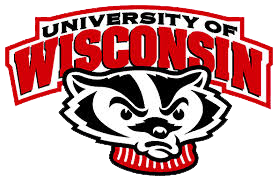 Click on the logo to inquire with the University of Wisconsin Spirit Squad for booking details. On Wisconsin! Truth Or Fiction – Heard a story you aren’t too sure of? Well, before you repeat it check out this site to confirm it. You’ll be amazed as to what is truth or fiction! The Local Forecast – Get the latest on the weather for all your plans! Billboard Magazine – Can’t think of a song title or artist? Check out the industry standard for all music, plus lots of fun related articles and information.